How Do I Know When To Contact A Water Damage Specialist? When facing water damage, homeowners and business owners must remember that any construction material that gets wet – be it flooring, drywall, insulation and / or carpeting – needs to be dried as soon as possible. Typically it takes between twenty four to forty eight hours before black mold, or any other suspected microbial growth problem, starts to grow and can be visually identified. 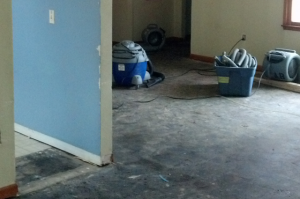 If water damage is left unattended, or the materials are poorly dried, black mold will start to grow immediately. Under such conditions, the effects of water damage will multiply and become harder to treat. Black mold can create a long-term health issue and cause irreparable and extensive damage to your property. It is, therefore, of uttermost importance to dry materials fast and expeditiously after water damage. When your home or premises become threatened by water damage, our company can provide you the necessary expertise to prevent or mitigate its devastating effects. Premier Restoration of Toledo’s professionals can help you preserve and restore your property in a timely manner, minimizing the havoc that water can cause. To prevent further complications, our company will urgently bring industrial dehumidifiers to your premises to dry up all surfaces and prevent mold formation. We have the equipment required to handle the most challenging situations. Our expertise in water damage prevention, water removal, and restoration, is unequaled in the industry, and our professionals available to you. We will safely dry, deodorize and disinfect all areas and surfaces flooded or damaged by water in your home or commercial building. What Equipment Will We Bring? Our company utilizes the best water removal equipment available, as well as the most effective combination of sanitizing agents, germicides, anti-microbial treatments, and deodorization products to prevent the appearance of odors produced by water and moisture. While our drying equipment will help prevent property water damage like swelling and warping of floors, walls and furniture, our disinfection products will prevent or stop the growth of all kinds of fungi, mildew, bacteria and any other harmful microorganisms. Some water damage situations require special techniques. For those cases, we may use powerful, water-proof and submersible pumps, for continuous pumping of high-level water; high-tech infrared cameras to to identify the location of all pools and sources of water for complete drying our your property; industrial fans and driers to generate airflow – this equipment is specially useful to dry up carpets, walls and furniture exposed to water and moisture-; industrial dehumidifiers to thoroughly dry your property, reduce air humidity levels and prevent any residual or secondary water damage; high-tech hygrometers and other meters to determine the exact degree of moisture saturation; portable water extraction units mounted on our company’s trucks, providing us with the ability to reach any location quickly and fast. Premier Restoration’s expert professionals are specifically trained to prevent and control water damage and will deploy all necessary resources immediately. Our professionals are always ready to serve you. You can always count on our company’s expert services for all of your water damage requirements, including remediation and restoration, as well as fire, mold and wind/storm damage restoration.